Monogramming has gained a huge popularity and continues to gain more at present. From fabrics to cars, numerous people are enthusiastic about doing it. Are you one of them? Probably, that’s why you landed on this page. Do you plan to buy a monogram sewing machine or an embroidery-only machine? Your needs, personal preferences, and current situation as a whole will define what you need. As a customer, you should think carefully before picking an item to buy. For suggestions, below are some short reviews of different monogramming machines. Take a close look at each option, weigh its traits, and decide whether or not it suits your taste and needs. We likewise included some facts about monogramming and helpful tips for consumers. 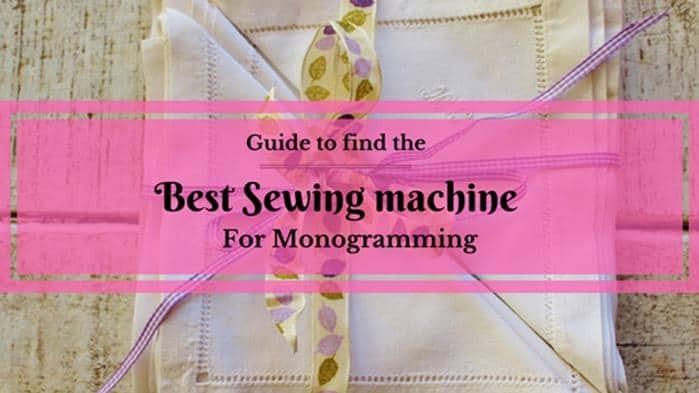 How do You Choose the Best Machine for Monogramming? Where do you plan to use your monogram embroidery machine? What size of the monogramming area/hoop do you need? Do your top choices offer additional features? Are your preferred items reasonably priced? What is the best brand for you? Does your choice offer a warranty? What are the Basic Facts about Monogramming and Monogramming Machines? What is a classic monogram? What are the letters’ positions when monogramming? Is it hard to learn monogramming? What are the applications of monograms? These days, many monogramming machines have come out in the market. Customers are given several brands to choose from, and it's becoming quite hard to pick the best. If you are experiencing the same challenge, here are some questions that you should answer to be able to make the right decision. Would you like to take a look at sewing machines that monogram or concentrate on embroidery-only machines? Well, it depends on your current situation. Do you already have a sewing machine? If yes, it is advisable to go for an embroidery machine that can monogram too. If you don't own any machine, a combination of sewing and monogramming model would be a better choice. A basic monogramming sewing machine likewise suits the needs of consumers who are on a tight budget. Meanwhile, you may also want to go for a monogram machine for beginners if this is your first time to try monogramming. Go for one that is easy to operate. Are you looking for monogram machines for home use? Or do you plan to buy a monogramming machine for small business usage? Your answer also contributes a lot in making the best choice. They have different features; some suit an office while some fit a household. Knowledgeable about monogramming machines or not, you should go for one that is user-friendly. You don't want to waste your energy trying to figure out how to operate your machine, do you? Don't forget to take a look at the monogramming area, for it determines how big your potential projects will be. If you're planning to create big designs, then it's apparently best to go for the bigger hoop. But if you are on a budget and you don't really need a big area for making your projects, then it would be more practical to purchase a machine with a small monogramming area. Want to enhance your designs or have more options? Some models provide additional features that can address these concerns. Choosing monogramming fonts for personalizing different items, selecting a particular design, and more are the benefits you can reap from going for additional features. Additionally, some advanced features will allow you to save a considerable amount of time operating your machine. For instance, some machines allow users to just swipe their fingers across the screen to choose an individual design. How much is a monogram machine? As you have noticed, some items above have touched the concern on a budget. Why? While price should not be the lone concern of a buyer, one can not disregard its importance. When looking at an item's price, it is a must to make sure that you're getting a good buy. You should not just settle for low-priced but poor-quality items just as you should not just opt for ones that are extremely pricey. Generally, the best monogramming machines carry the best brands. But, what makes a good brand? Popularity? Maybe. It is important for you to know where a brand’s popularity is coming from. When considering brands, prioritize the ones that are reputable. Go for the manufacturers that have earned the respect of numerous consumers. Choose the ones that have consistently produced high-quality monogramming machines and have provided good-quality service. As you know, a warranty may speak for an item’s quality. For this, you should make it your primary concern to closely look at the warranties offered by your prospective products. Never go for one that does not offer any warranty. As a responsible consumer, you should take these considerations seriously. Doing so will enable you to choose the monogramming machine, while failing to do so will lead to another failure. You can never make the right choice without careful thinking; take note of that. From the details you have learned above, you may seem ready to pick the best monogram machine for you. To make you even more ready, here are some basic facts you may still not know. Reality check: Numerous people tend to focus so much on acquiring advanced knowledge while they forget to feed their minds with the most basic piece of information about their particular concern. The classic monogram consists of three letters that represent a person’s name. Specifically, they are the initials of a person’s first name, middle or maiden name, and last name. When monogramming, gender defines the letter’s positions. As for a woman’s initials, the middle letter will be her last name, and it is larger than the other letters. As for men, his initials can either be in order or his last name in the middle. If he chooses the former, the middle letter will not appear larger than the other letters. Monogramming is a skill; hence, it can be easy or hard, depending on your familiarity with it or with sewing. And just like any other skill, you need to practice monogramming to become good at it. For this, it is important to take your time when learning about it. Using your monogram embroidery machine without practice will lead to a couple of blunders. The truth is monogramming machines may work differently depending on their features and other factors. For instance, the number of needles used to create a design affects. But generally, what you first need to do is start creating your design. Then center where you want your design to sit using a hoop. Soon after, set your machine to work. Most machines have the capacity to guide the fabric and change the stitches. Have you heard of some claims about officials warning against monogramming? The truth is the National Criminal Justice Reference Service warns against having your child’s name on different visible personal items. This is for a reason doing so might attract abductors who could pretend to know your child by calling out his or her name. As you see, the warning is not about monogramming. But in relation to it, it is important to take note you can use such warning to safely personalize your children’s stuff. As you may already know, any item’s price depends on its features. Machines intended for commercial use have more advanced features compared to those intended for household use; hence, they are more expensive. The price range for the commercial machine is from 1000 to 5000 dollars. The price range for the domestic machine is from 250 to 900 dollars. Sometimes you can get really good machine around 600 dollars mark. First off, you can put a monogram on your belongings for security. You may also do it for mere identification and styling purposes. You are at liberty to use monograms on any item you own. Moreover, you can also go for using monogrammed items as personalized gifts. Apart from the beautiful design you can create, using monograms puts a personal touch on every present you give. With all these basic details in mind, it may already be safe to say that you are now ready to make a purchase. Feel free to do more research to increase your chances of picking the best choice. Some do monogramming as a hobby or business. Some do it ‘just because’ or due to mere amusement. If you plan to buy a monogramming machine, make sure you know the exact reason for wanting to do it. Look into all the things that can contribute to picking the one that fits your needs. Also, it is important to know everything you need to know and to look at all the options you see. After all, it is your hard-earned money that you will spend. You wouldn’t want to waste it by making a poor choice.